SWOT (strengths, weaknesses, opportunities, and threats) is a term which covers an analytical paradigm that is also a helpful tool for a company while facing its greatest challenges as well as finding new and the most promising markets for it. As for the business context, SWOT Analysis Report Example gives an opportunity for the organizations to define the internal and external agents of influence. Thus, the main objective of the SWOT analysis is to develop a full awareness of all the issues concerned with the important decisions of a company. Correspondingly, the example below provides the audience with the SWOT analysis of Starbucks in the business dimension. Diversification of the business within subsidiaries. Today, Starbucks is known as one of the most popular and reputable brands in the world. The number of the customers is growing continuously due to the high quality, the perfect service, and the attitude received by the clients. What is more, the company has got a global suppliers’ network. The availability of the businesses, such as Ethos Water, Teavana, and Seattle’s Best Coffee, underlines the role of the subsidiaries for Starbucks. This fact proves that the brand is adaptive and resilient as well as able to diversify the production and become a global supply chain. 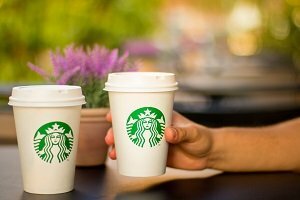 The fact is that the higher prices of the products suggested by Starbucks result in its inaccessibility for both the lower-middle class and lower class representatives. The general standards of the production as well as its imitability are also the considerable weak points. In such a way, Starbucks should work on innovations in order to overcome the mentioned weaknesses, especially the one that deals with the products’ imitability. New partnerships or alliances with other brands/firms. All three points are efficient and able to strengthen Starbucks Coffee’s competitiveness on the market. In other words, this element of the SWOT analysis demonstrates the possible opportunities of Starbucks for the global growth. The most obvious low-cost coffee sellers and competitors of Starbucks are McDonald’s and Dunkin’ Donuts. As for the imitators, there appeared many successful competitors such as Stars and Bucks (in the Palestinian Territories). Besides, there is a social movement supporting the independent coffeehouses, which gain momentum. This movement opposes such large coffeehouse chains as Starbucks. Overall, the Threats part in the SWOT analysis helps to determine the possible hazards of the Starbucks business, points on the necessity of the competitive advantage strengthening. Lombardo, J. (2015). Starbucks Coffee SWOT analysis. Panmore Institute. Web. 21 Sept. 2016. Retrieved from http://panmore.com/starbucks-coffee-swot-analysis.